You want to find excellent gifts for Mother’s day, and you think about birthstone rings for moms. You have an exquisite idea. Birthstone rings are surely meaningful gifts for you to show your love to your mom or your wife. Each stone on the ring will represent each love of her such as her children, her husband, her family members, and herself. 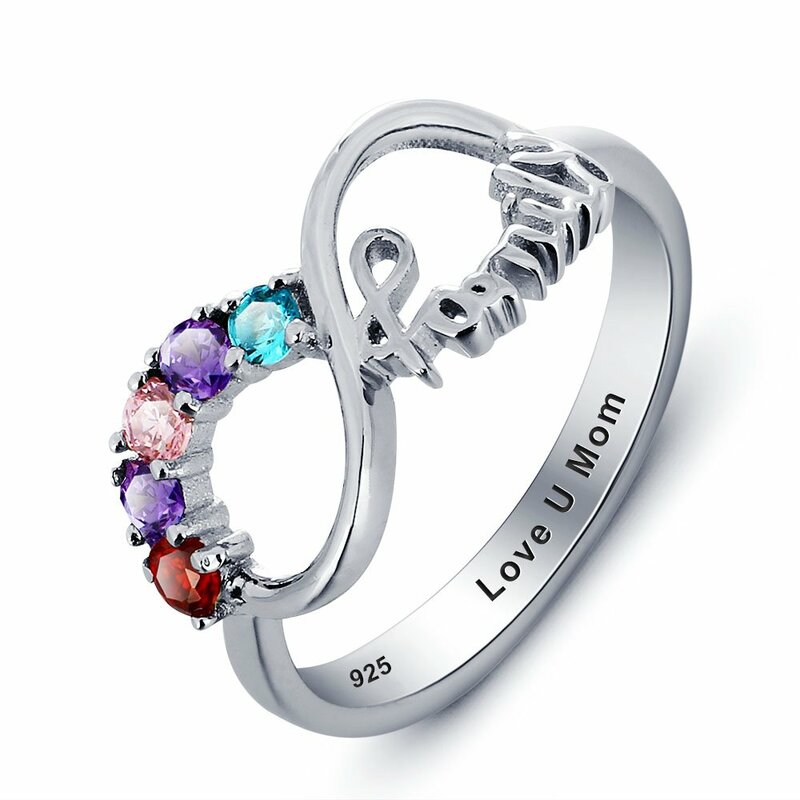 Especially, you can send mom thoughtful message with your customized inscriptions, and all are engraved beautifully on the ring. Birthstone rings for mom show your endless love for the person get them. This list will show you the best birthstone rings for mothers that help you choose the most beautiful one for the women you love. If you want to find other wonderful gifts, please visit our list of mother day gift ideas and find the best one. We also collect the lovely mother’s day wishes to give you ideas to make her smile. 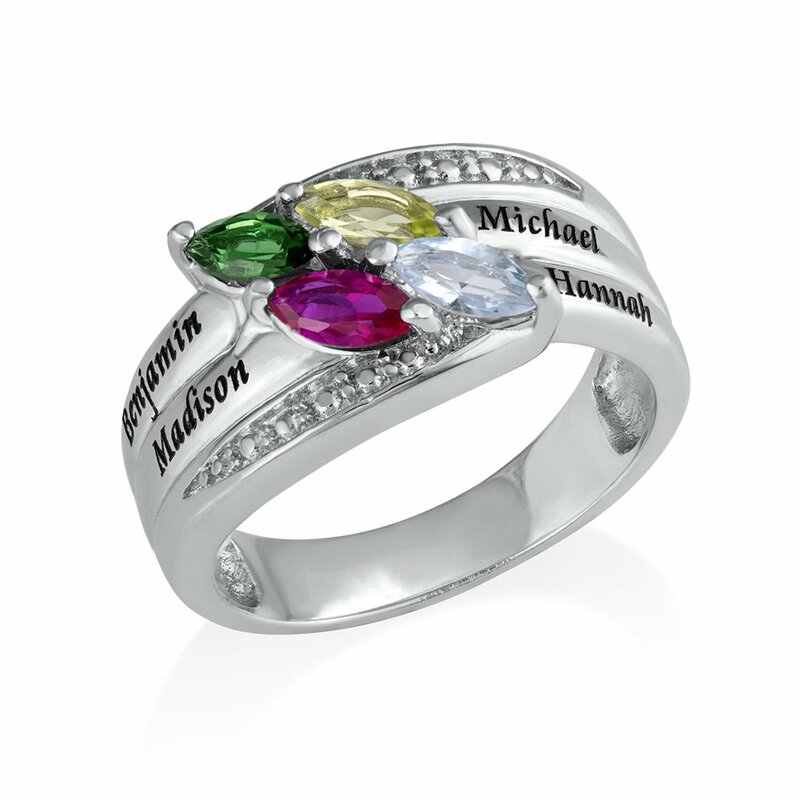 This exquisite Personalized Mother Rings 3 heart-shaped Birthstones, 3 Names, and 1 Engraving is sure to delight. Personalize your choice of 3 birthstones, 3 names and 1 inside engraving with double rhodium overlay for extra high shine and durability. Great gift as a mother’s ring, anniversary ring, promise ring or personalized birthstone ring. Free 3 year warranty against tarnish and stones, Free Jewelry Gift Box & Polishing Cloth, Free Engraving, Free Tracking & Insurance. This Two Hearts Ring makes the perfect gift or a unique gesture for Mother’s Day. This 0.925 Sterling Silver with Swarovski ring is great for moms who want to keep their children close to them. 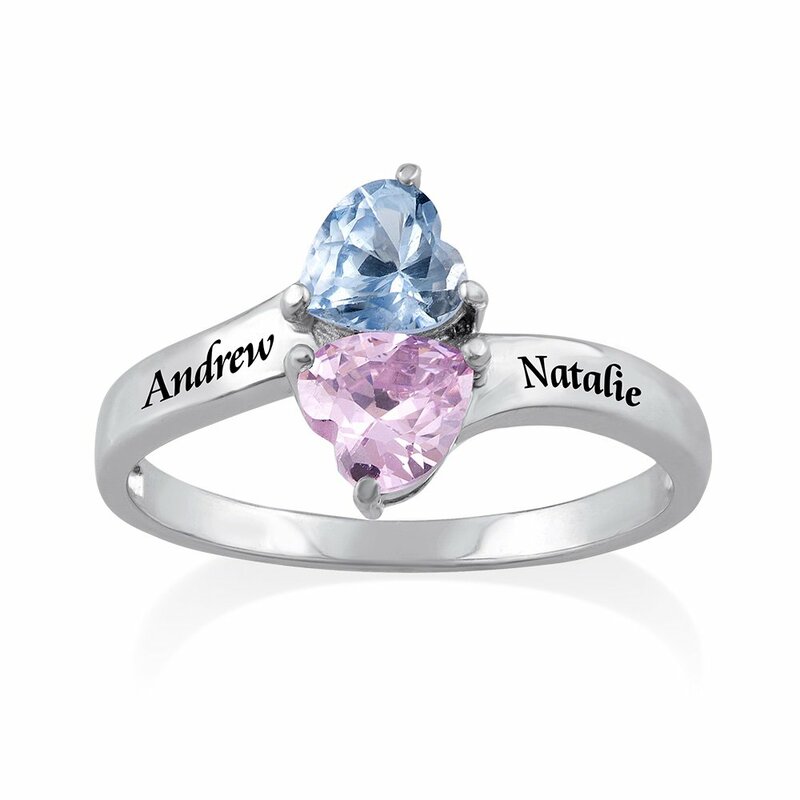 This adorable ring has two hearts next to each other which you can personalize with two names or words, and two Swarovski Crystal birthstones. The Two Hearts Ring is made of Swarovski Gemstones and 925 sterling silver measuring 0.3 inches, 7.6mm wide and 0.7 inches, 1.85mm thick. You can also make this gorgeous ring extra personal by adding an engraving on each side of the band. There are many sizes for your choice. 1/ Choose your desired ring size from the drop-down menu. 2/ Click on “Customize Now” for personalization and checkout. 3/ Type in two names or words and the colors of the corresponding Swarovski stones in the box and then proceed to checkout. 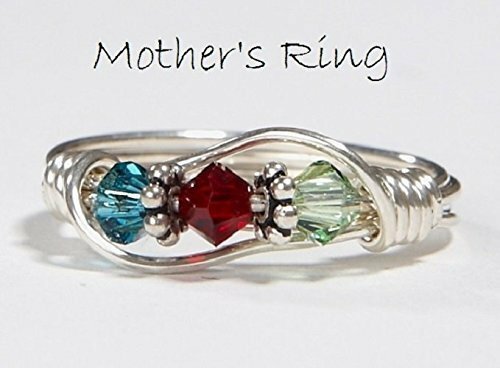 This Mother’s birthstone ring is made with 3 Swarovski Birthstone Crystals and sterling beads that are wrapped with sterling silver wire. PLEASE NOTE: This listing is for a Mom’s Ring with three crystals only (crystals are 1/4″ in size). This Mother’s Ring comes in a gift box and also makes a wonderful Grandmother’s Ring! Perfect for Mother’s Day, Anniversary, new baby, birthday, Christmas, Valentines Day. This ring is handmade and cannot be returned. So please be sure the ring size and crystals that you order are correct! This gorgeous Birthstone Ring for Mom is the perfect way to show mom how much she means to you. Her face will light up when you give her this beautiful ring, personalized with 5 birthstones of each one of her children or family members. Mom deserves a special way for her to show off her family and remain fashion forward! 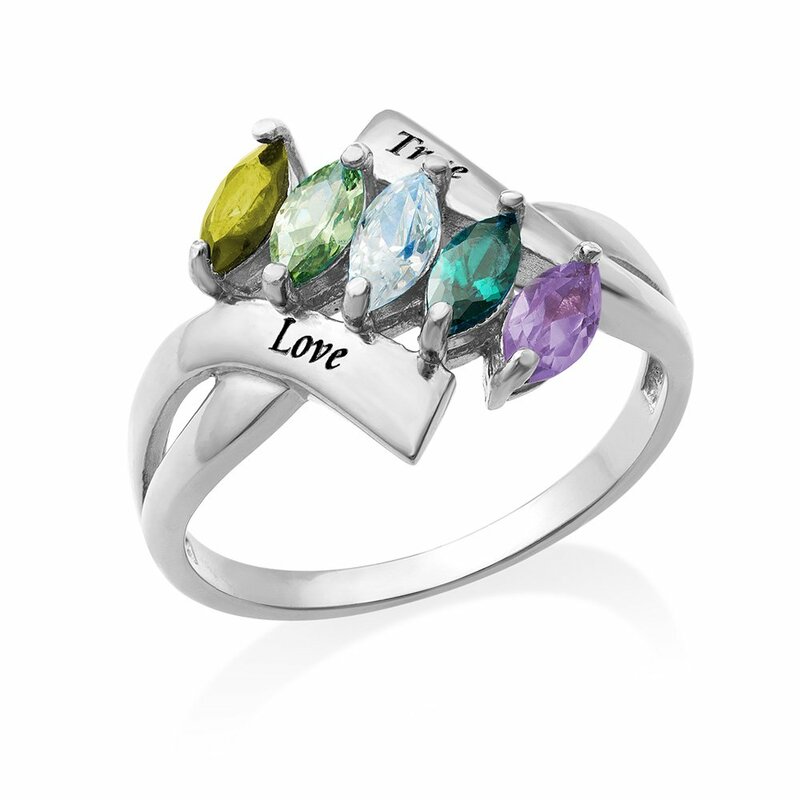 Personalize your ring with 2 inscriptions and 5 birthstones. You can also make it extra personal by engraving 5 names or a short phrase next to each stone. Width: 11.66mm / 0.45″. Thickness: 2.38mm / 0.09″. Measurements: 14.33mm / 0.45″. Made of 0.925 Sterling Silver. Sizes 6, 7, 8 , 9. This Mother’s Ring makes the perfect gift or a unique gesture for Mothers Day. This ring arrives in an elegant gift box, ready for giving or receiving. The Mother Ring is made of Swarovski Gemstones and 925 sterling silver measuring 0.43 inches, 11mm wide and 0.10 inches, 2.65mm thick. This Ring is Personalized and Customized for you. This Fabulous Mother’s ring comes with your choice of 1 to 6 Princess Cut Simulated Birthstones in Sterling Silver or Solid 10 Karat White Yellow or Rose Gold. This ring absolutely is charming. The ring looks like the loveliest piece of art. It is time to do something for your mother. Go ahead and create a vision in metal and stone only for mommy dearest. It is lovely, just gorgeous, and very easy to wear in that it matches any outfit. 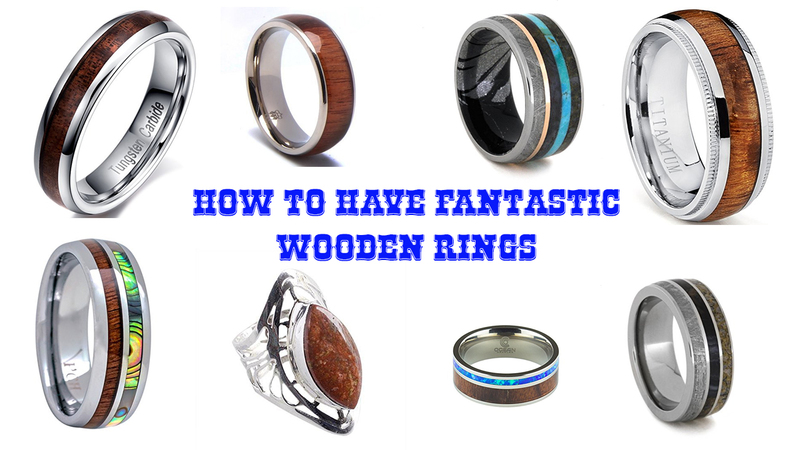 It is an elegant ring suitable for all occasions. Treat her like a queen with the gift of this Sparkling Simulated Birthstones. This Ring is Personalized and Customized for you. 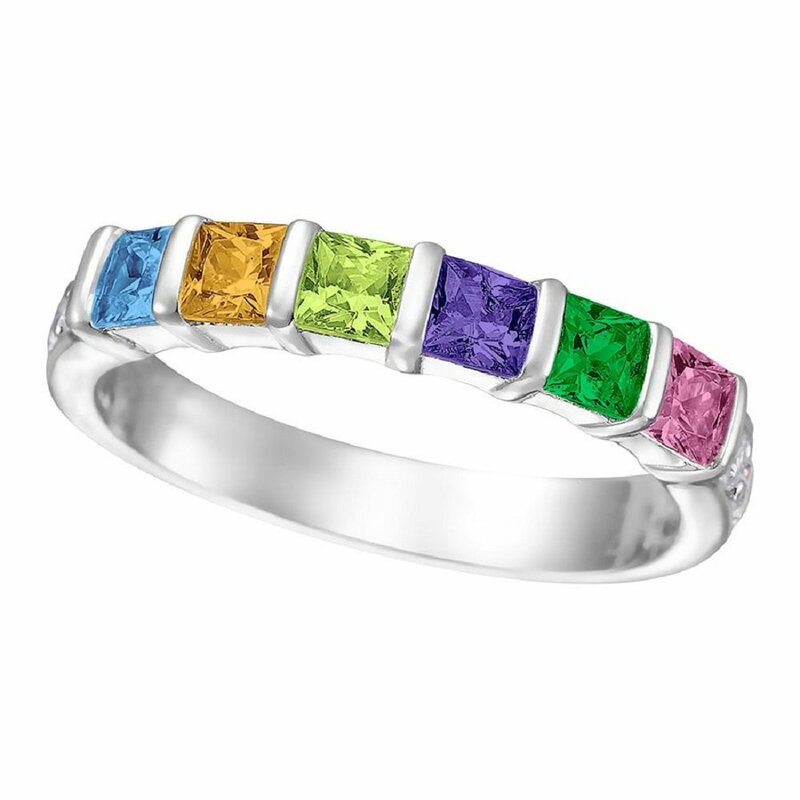 This Mother’s ring comes with your choice of 1 to 6 Princess cut Swarovski Simulated Birthstones in Sterling Silver. The Princess Cut Simulated Birthstones measure 3.0mm each. It is 3.5mm Wide and 1.9mm Thick. This Stunning Princess with Side CZs Mothers Ring Trim by Channel Set Faceted of Your choice of 1 to 6 Simulated Birthstones on Middle with Round Birthstone on Both Side Arm with Mirror Polished Flat Edging. This Ring is Framed in Silver or 10k White, Yellow or Rose Gold. Great Gift for Mom or any special women in your life. It’s time to make her life and time more special and memorable. This gorgeous ring is made of 925 Sterling Silver with and includes 4 simulated birthstones. You can also engrave 4 names next to each stone. 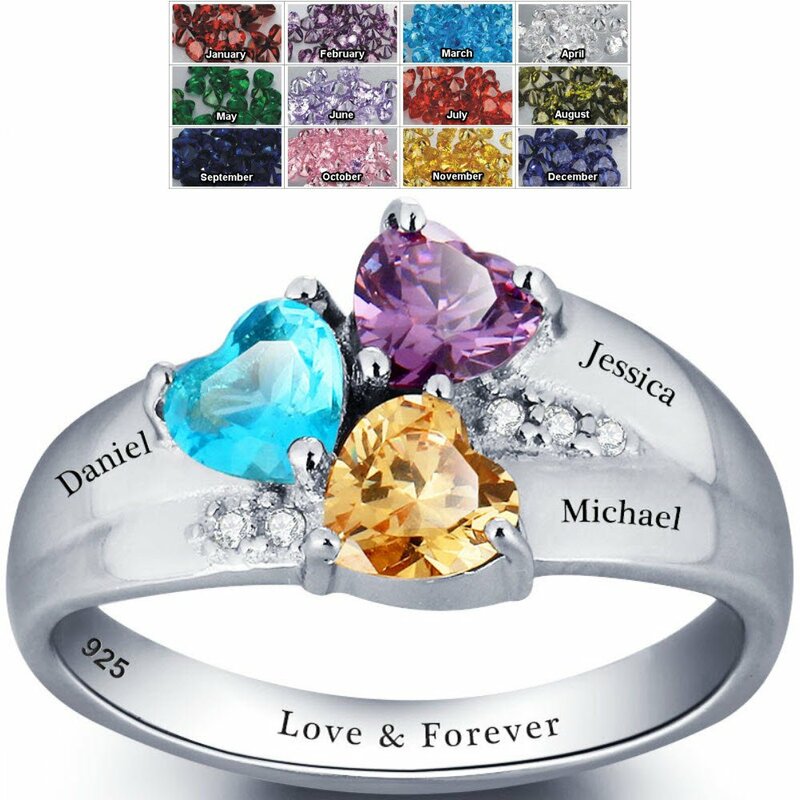 Personalize your ring with 4 inscriptions and 4 simulated birthstones. Width: 12.3 mm, Thickness: 3.6 mm / 0.14″. Made by 925 Sterling Silver. 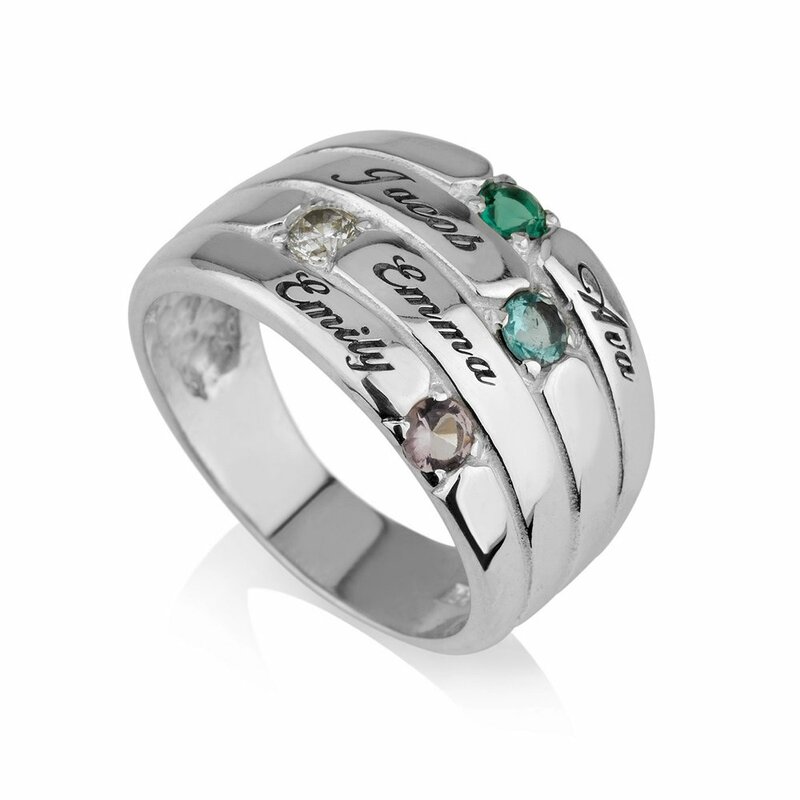 This exquisite Personalized Mothers Ring with 5 Birthstones and 1 Engraving is sure to delight. Your choice of 5 birthstones and 1 inside engraving. Double rhodium overlay for extra high shine and durability. Arrives on average within 10 business days. 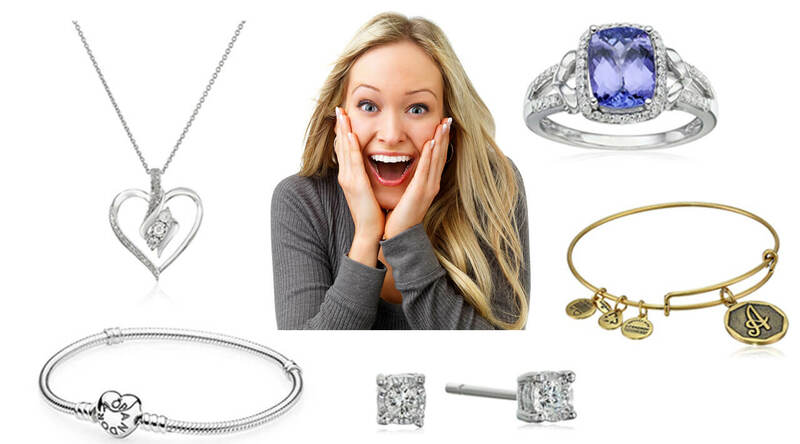 Free Jewelry Gift Box & Polishing Cloth, Free Engraving, Free Tracking & Insurance. 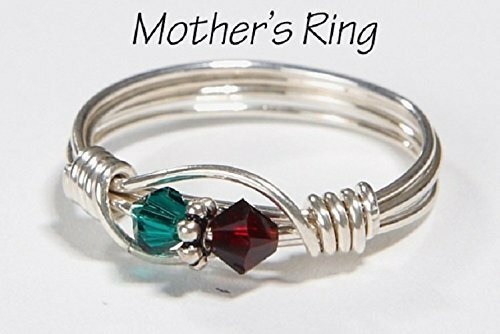 This Mother’s birthstone ring is made with 2 Swarovski Birthstone Crystals and sterling beads that are wrapped with sterling silver wire. This listing is for a Mom’s Ring with two crystals only (crystals are 1/4″ in size). This ring is handmade and cannot be returned! So please be sure the ring size and crystals that you order are correct! Birthstone rings are meaningful and exquisite gifts for moms. Jewelry is so diverse, and you may find beautiful jewelry for the women you love in this mothers jewelry collection. Previous articleWhich Gold Ring Is The Most Trending One Now? Next articleHow Do You Choose The Best Mother Day Balloons? Although the term Garcinia cambogia extract” is not made use of by the clinical area, it’s the main term utilized by the dietary supplement neighborhood. I’ve a challenge that I am simply now running on, and I’ve been at the look out for such info.